In the last weeks, Italy has witnessed a spiralling resurgence of xenophobia, with migrants being violently attacked by gangs of far right activists and marches against immigrants organised in highly diverse, and often deprived, neighbourhoods by alleged ‘ordinary’ citizens. The long list of episodes which are contributing to create a toxic climate and a widespread sentiment of moral panic, includes a visit by the media-savvy new leader of the Northern League, Matteo Salvini, to a Roma encampment just before the regional election in Emilia Romagna that provoked a violent response from anti-fascist and anti-racist activists and hours of media coverage for Salvini; and a 500 people-strong sit-in organised by the right wing student organisation Blocco Studentesco in front of a Roma camp in via Cesare Lombroso in Rome to protest against the alleged misbehaving of some Roma against a local school. Demonstrators were accused of intimidating young Roma students who were on their way to school. 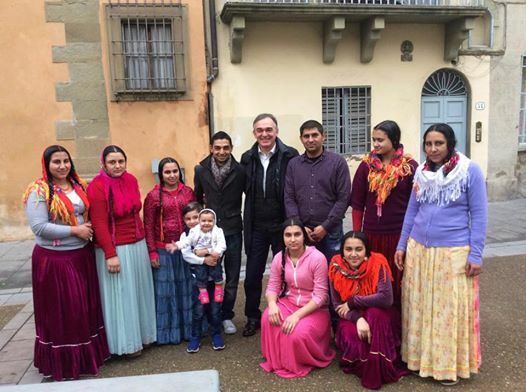 What the Roma rights NGO OsservAzione has termed the ‘Salvini method’- the deliberate targeting of highly stigmatised and voiceless communities to grab media attention and feeds the induced moral panic with banal but highly effective sound bites – is spreading rapidly across Italy. Hardly a year from the Lampedusa tragedy, the solidarity that had sustained the response of the Italian authority through Mare Nostrum operation is vanished, and new migrants and Roma are made scapegoats for a society undergoing a prolonged period of economic stagnation and waking up from the promises of rapid transformation of the PM Matteo Renzi. While at the national level, the anti-immigration flag is carried by the Northern League engaged in a radical rebranding that would transform it from a regional and secessionist party into the Italian version of Le Pen’s Front National, at the local level, in cities like Rome an odd coalition of right wing extremists, centre-right politicians and members of the mayor’s own party (PD) is using immigration and the Roma in particular to fuel public anxiety in the attempt to force the current mayor Ignazio Marino to resign. In such a climate, it is therefore remarkable and noteworthy a photo posted on his facebook page by the president of Tuscany regional authority, Enrico Rossi. The photo portraits President Rossi with his neighbours, a family of Romanian Roma. The caption includes the name of each member of the family and nothing else. This was enough to provoke over 5,000 comments, mostly negative, if not violent and openly racist, as well as 4000 likes. The accusations against the president reflect closely the repertoire of stereotypes on Roma people, and while they vary they can broadly be summed up as ‘we are the good citizens (ie. tax payers, law abiding, white, native, hard workers) and instead you choose to side with them (ie. foreigners, benefit scroungers, non-white, thieves, parasites, criminals)’. And it doesn’t matter if the Roma family includes children attending school regularly, adults that work and pay tax and have no criminal record. The point is that the people in the photo are not accepted as neighbours; they are dehumanised and deprived of their individual stories. It is admirable that the president hold his position despite the storm generated by the photo – ‘a social media disaster’ according to one of his party mate – and has also responded to many of the comments to his post individually. Whether or not this decision is going to affect the political career and the electoral fortune of Mr Rossi in the medium-long term is too early to say, but it is likely that we will see the photo reappear on billboards before the next election. This entry was posted in migration and mobility, politics and tagged Italy, Matteo Salvini, politics, racism, Roma, Romophobia, xenophobia. Bookmark the permalink.